The uncertainty over how to prevent school shootings — and the horrifying consequences of failing to do so — has created a business opportunity. With each new school shooting — the latest left 10 dead Friday in Santa Fe, Texas — the routine of death and grief grows numbingly familiar, and so does the inescapable question: Is there any way for schools to stop them? School districts trying to avoid becoming next on the list are urgently chasing answers, with an increasing number staking their hopes on high-tech security systems originally developed for the military, police and private industry. “If all you’re doing is buying something and slapping it on and going about your business, you have wasted your money and you’re no safer than you were before,” said Amy Klinger, director of the Educator’s School Safety Network, an Ohio-based nonprofit. Many states and districts are pursuing low-tech routes as well, welcoming more armed guards, allowing teachers to carry guns, and even handing out rocks or baseball bats. But districts of all sizes are opening up their budgets or chasing government grants to pay for state-of-the-art technology, often acting on the theory that, when it comes to layers of security, more is always better. “How do you know if something is going to happen or not happen?” Jim Scully, superintendent of the 7,300-student school district in Haverhill, Massachusetts, said in an interview last month. While overseeing the recent construction of a middle school, Scully persuaded district officials to install a network that identifies the sound of gunfire and alerts police and administrators. Made by Shooter Detection Systems using technology developed for the military, the network cost $70,000, covered by state and federal grants. The system has not been deployed since its initial practice run. After 17 students and staff members were killed at Marjory Stoneman Douglas High School in Parkland, Florida, on Feb. 14, the school district in Santa Fe, Texas, sent out a reminder of its security procedures. Superintendent Leigh Wall said in a letter to parents and staff that the measures included security cameras, "visitor tracking systems” and a “district-wide connected emergency warning and announcement system.” She also stressed that the district had its own police department, with 12 officers trained to handle active-shooter situations. One of the district's police officers was wounded in Friday's attack, when a 17-year-old student with no criminal record entered Santa Fe High School just before the start of classes armed with a shotgun and handgun owned by his father, and opened fire, authorities said. Eight students and two teachers were killed, and 13 people were wounded. Most school shootings around the country, they had cameras and that didn’t prevent it. The uncertainty over what can be done at a local level to prevent school shootings — and the horrifying consequences of failing to do so — has created a business opportunity. Companies seek to convince schools that the technology deployed by police in the U.S. and by the military overseas can also save lives in the classroom, and that their products have already been proven effective. Alexander S. Carney, a former special operations officer in the Marines, is now a vice president for Critical Response Group, which makes digital and shareable school floor plans based on formats used in counter-terrorism raids. “As we speak, the technique we’re talking about is being used in multiple countries, in multiple places in those countries,” he said. Dozens of school districts in New Jersey, where the company is based, have adopted the plans. The company saw a spike in inquiries after Parkland, and again after the Santa Fe shooting. These digitized graphics, along with tools like shot-detection systems, are likely to shorten emergency response times or reduce the number of victims of a mass shooting. The graphics, which start at $1,880 per school, place building layouts on map-like grids, allowing police to quickly familiarize themselves with the scene, identify where a shooting is happening and plan their response. But whether high-tech products can keep such attacks from happening remains an open question, researchers and safety consultants say. That was among the concerns raised in a 2015 RAND study on the growing use of school-safety technology. Researchers surveyed a variety of school districts and encountered officials “in desperate need of more evidence on what works.” Some of the products — visitor management systems, anonymous tip lines — were relatively simple, inexpensive and sensible, the researchers said. But they also found scant evidence of most high-tech tools’ effectiveness, and some of the technology might make students feel as if they were under siege, the researchers said. After the December 2012 massacre at Sandy Hook Elementary School in Newtown, Connecticut, the National Institute of Justice made school safety research a priority, doling out tens of millions of dollars each year to projects that sought to understand school violence and how to stop it. Much of that work has not yet been completed. And now the funding source appears to be drying up. A federal spending bill passed in March eliminated the NIJ grant programs. Instead, after the Feb. 14 massacre in Parkland Congress passed the STOP School Violence Act. It redirected federal funding toward anti-violence training, installation of metal detectors, anonymous tip lines and better mental-health services, rather than research into technology-based solutions. The lack of research hasn’t stopped districts from investing in high-tech promises. School administrators said they want to be smart about what they buy, but they are also guided by parents’ desire for added security — even if those systems are never used. Scott Laliberte, superintendent of schools in Londonderry, New Hampshire, took advantage of a state grant offering contracts with COPSync, which allows teachers to hit a panic button on their classroom computers and communicate with authorities via text message. The system has not been put to use yet. But in a couple of accidental activations, Laliberte said, he saw that it gets officers to the scene quickly. “Tools like this come out, and they are certainly useful, but it’s important to keep in proper perspective that they are part of larger solution we’re trying to create,” Laliberte said. The sooner the police get there, the sooner the carnage ends. A post-Parkland analysis by IHS Markit noted that the school security market had surged to about $2.7 billion a year. 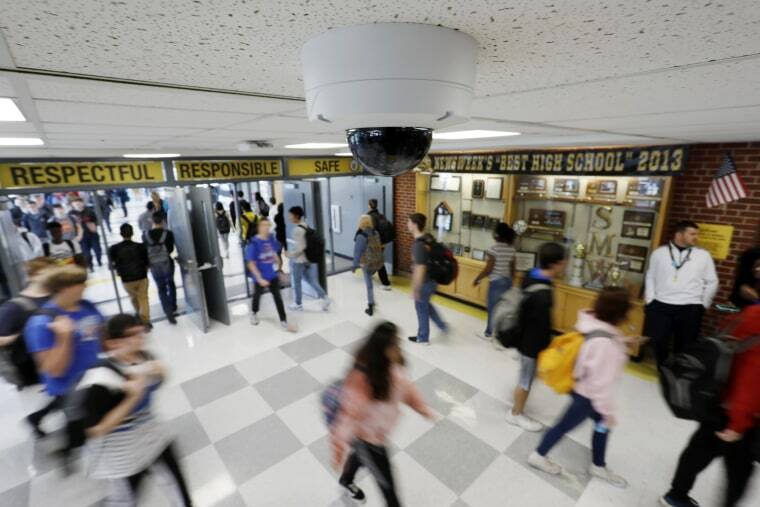 The next wave of products available to school districts could include facial-recognition cameras and impenetrable classroom doors, the firm said. The recent buying spree has troubled some school-safety experts, who stress that no cutting-edge measures compare to old-fashioned student care: communicating with them, listening to what they say, and offering help when they need it. The school district in Toms River, New Jersey, which has more than 15,000 students in 19 schools, takes a “holistic” approach to safety that doesn’t just rely on technology, said Superintendent David Healy. That includes programs that identify troubled students and get them help. Still, the district recently used a grant to enroll in Critical Response Group’s system that digitizes the layouts of buildings and makes them shareable with law enforcement. Paired with a network of internet-accessible surveillance cameras, the system allows police to get to the source of a problem quickly, officials say. “It’s all about expediency. The sooner the police get there, the sooner the carnage ends,” Healy said. In Overland Park, Kansas, John Douglass says he has all the proof he needs that high-tech security is worthwhile. The former police commander is executive director of emergency services for the Shawnee Mission School District, which issued $20 million in bonds to pay for security upgrades at five high schools. They included a network of internet-based surveillance cameras and door alarms that can alert and track intrusions remotely, monitored by control centers in each school. Just after they were installed, nearly four years ago, the system was used to track and arrest a boy who was threatening two students via text message. Officers saw him on camera trying to get in a back door to a school, and when they stopped him, he was on his way home, where police found guns stacked in his bedroom, according to police. He was charged with aggravated criminal threat. The system has also helped interrupt two less serious intrusions since then, Douglass said. “That tells us the system is working,” he said. The ultimate manifestation of the rush to high-tech school security may be 40 miles south of Parkland, in Miami-Dade County. It is home to the nation’s fourth-largest school district, with 345,000 students, 40,000 employees, nearly 400 schools and thousands of reported crimes each year. The district’s police department has less than 200 officers. Better technology seemed the only way to try to keep up with potential threats, said Edwin Lopez, the district’s police chief. “We’ve had to alter our response from traditional law enforcement techniques to a more technological response,” Lopez said. After the Newtown shooting, the Miami-Dade Schools Police Department pitched the National Institute of Justice on a project it called Campus Shield. The police envisioned a system that collected massive amounts of data — social media feeds, attendance records, school incident reports, nearby crimes, citizens’ tips — and funneled it through software to identify patterns or signs of trouble. This “fusion center” would be linked to the district’s network of surveillance cameras, its school-visitor system, its gunshot-detection system and team of mental-health specialists. If it worked, the massive security package could be copied elsewhere. The district won a $4.3 million grant, and the project is now being piloted at 18 schools. An independent research company is comparing crime and student performance with schools that are not part of the project; its results are expected in the fall. Lopez said that the project has led officers to students expressing suicidal thoughts and uncovered white-collar crimes such as credit card fraud. Campus Shield was featured in the 2015 RAND report as an example of a district that is “putting it all together.” Schwartz, one of the report’s authors, called it “the Cadillac” of school security plans — but cautioned that it may only be applicable to the nation’s biggest, and big-budgeted, districts. As Santa Fe mourns the students and teachers killed in Friday’s shooting, there is urgency in finding solutions that will work for all school districts, big and small.